Jerusalem - New details have been revealed about the cross-border Palestinian Islamic Jihad (PIJ) terror tunnel destroyed by the IDF in late October. 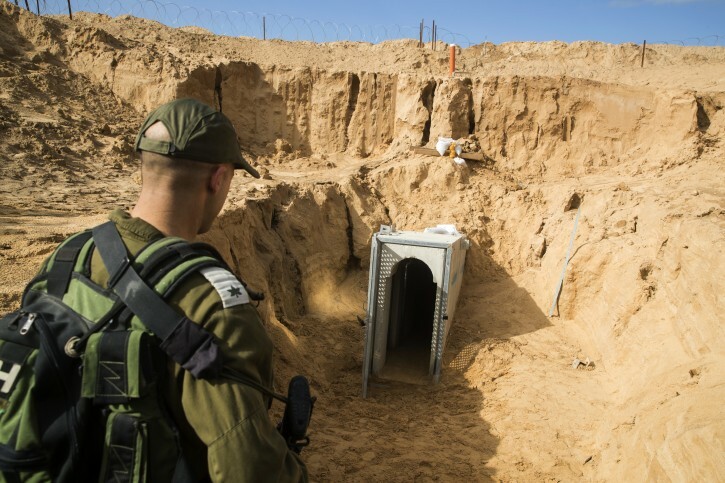 The tunnel, which infiltrated about 200 meters into southern Israel and was located only two kilometers from the community of Kissufim, is believed by the IDF to have been intended to be used to attack Kissufim and/or abduct Israeli soldiers. Several PIJ terrorists worked around the clock except on Friday, digging in shifts of 2-3 diggers at the front with the rest acting as logistical support. They were able to dig between 10 to 20 meters a day, at a depth of 26 meters below ground aided by electricity, oxygen tanks and water to avoid suffocation. The terrorists did not try to hide the sand which they removed, creating large sand dunes on the Gazan side. 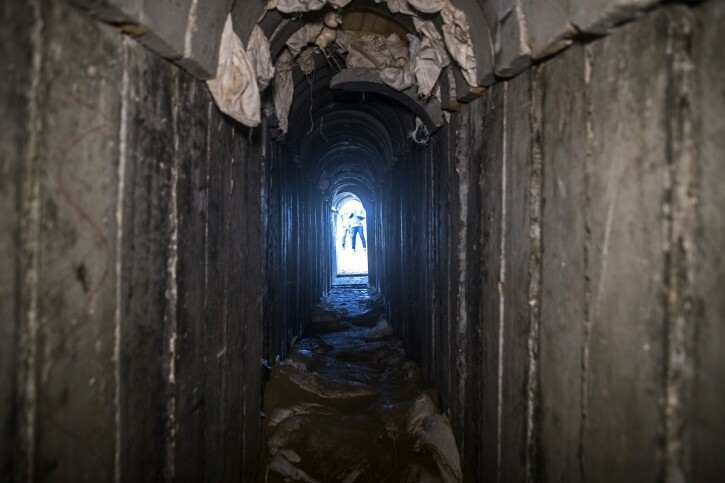 The tunnel was detected using newly implemented advanced technology and was destroyed in a controlled explosion inside Israeli territory but it remains open on the Gazan side, guarded by Hamas terrorists. During the 2014 war, several soldiers were killed by Hamas terrorists when they emerged from the numerous tunnels they dug into Israel, surprising the IDF and leaving the residents of border communities concerned of possible tunnels beneath their homes. By the time of the last ceasefire, the IDF said it had destroyed 32 tunnels that crossed under the border. At least six tunnels have been destroyed since the end of the operation, four of which were destroyed since October alone. Israel’s military has been investing extensive effort in locating cross-border tunnels from Gaza, constructing a 3 billion shekel underground barrier along the entire border with the Hamas-run enclave. The underground barrier is made from bentonite and is combined with large iron cages with water-resistant pipes and a system of advanced sensor and monitoring devices to detect tunnels. On top of the underground barrier a 6 m. high above-ground fence will be built to prevent anyone from crossing above ground. While the IDF is confident that no tunnel will be able to cross the underground barrier, there remains a large amount of construction on the barrier which has not yet begun, including in the area where the tunnel was located. A senior officer in the Southern Command stated on Thursday that 4 kilometers of the barrier have already been completed and the rest is expected to be finished by 2019. “By the end of the year will will finish over 50% of the barrier,” he said, adding that the IDF began building it in areas which were most at risk such as the city of Sderot and the communities of Nativ Ha’asara and Nahal Oz. Hamas has accepted the fact that they have lost their strategic offensive tunnels with this project, he continued. While Israel’s security establishment does not believe that Hamas is wanting another conflict with Israel, “the situation remains fragile,” the senior officer said. Yet we have geniuses here that cry against settlements and ask me how do settlements save lives? Well step back a second and imagine a scenario where due to the Palestinians close proximity and easy mobilty to a large city they tunnel their way in. Chas vasholom the causalities can be enormous. Its much harder to tunnel if you are far away and have to hide your tracks more. “ Yet we have geniuses here that cry against settlements and ask me how do settlements save lives? The roadblocks can stay in place. No reason to build settlements. Without settlements roadblocks won't stay in place. It just won't happen. Its the settlements that keep those animals locked in their cage. Boruch Hashem this threat is being removed. It's possible that within a few years, Israel will be impenetrable and these guys will be completely isolated form Israel.